1. any structure, cell, or histologic element staining readily with basic dyes. 2. a granular leukocyte with an irregularly shaped, pale-staining nucleus that is partially constricted into two lobes, and with cytoplasm containing coarse bluish-black granules of variable size; about 1 per cent bring anticoagulants to inflamed tissues. 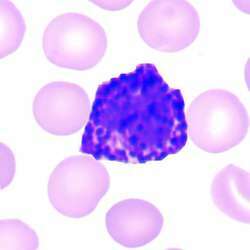 Called also basophilic leukocyte. 3. one of the hormone-producing basophilic cells of the adenohypophysis; types include gonadotrophs and thyrotrophs. Called also beta cell. 1. A cell with granules that stain specifically with basic dyes. 3. A phagocytic leukocyte of the blood characterized by numerous basophilic granules containing heparin, histamine, and leukotrines; except for its segmented nucleus, it is morphologically and physiologically similar to the mast cell although they originate from different stem cells in the bone marrow. 2. a granular leukocyte with an irregularly shaped, relatively pale-staining nucleus that is partially constricted into two lobes, and with cytoplasm containing coarse bluish-black granules of variable size. A cell, especially a white blood cell, having granules that stain readily with basic dyes. a granulocytic white blood cell characterized by cytoplasmic granules that stain blue when exposed to a basic dye. Basophils represent 1% or less of the total white blood cell count. The relative number of basophils increases in myeloproliferative diseases and decreases in severe allergic reactions. An increase in number is seen during the healing phase of inflammation. Basophils produce histamine during inflammatory reactions. Also called basophilic erythrocyte.Compare eosinophil,neutrophil.See also agranulocyte,differential white blood cell count,granulocyte,leukocyte. basophilic, adj. A type of granular leukocyte with large, distinctly basophilic/“blue” secondary granules containing heparin, histamine, platelet-activating factor (PAF) and other mediators of the immediate hypersensitivity response, which are released when IgE cross-links to the high-affinity Fc receptors on the cell surface. 3. A phagocytic leukocyte of the blood characterized by basophilic granules containing heparin and histamine; except for its segmented nucleus, it is morphologically and physiologically similar to the mast cell, although the two cell types originate from different stem cells in the bone marrow. Having an affinity for alkali. The term is used conveniently to refer to the group of blood white cells (leukocytes) whose internal granules take up an alkaline stain. The granules in basophils are mainly histamine and it is the release of this powerful chemical that causes most of the trouble in allergy. Basophils closely resemble tissue MAST CELLS. n white blood cell with cytoplasmic granules and histamines used to direct other WBCs to inflamed areas. 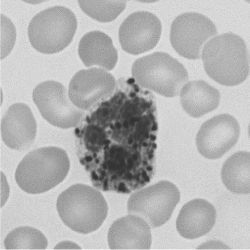 A phagocytic leukocyte of the blood characterized by numerous basophilic granules containing heparin, histamine, and leukotrines. 1. any structure, cell or histological element staining readily with basic dyes. 3. a beta cell of the adenohypophysis. a beta cell of the adenohypophysis which produces luteinizing and follicle stimulating hormones. an in vitro cellular test for immediate hypersensitivity; it detects degranulation of basophils, by their loss of affinity for staining, when blood from a hypersensitive dog is incubated with allergen extracts. If female patients with CFS and MCS and HT-related autoantibodies are found to have functional anti-FceRla and low or even borderline low CI INH levels, the cumulative effect may be significant, and although female patients with hypersensitivities and ANA may have anti-FceRIa less able to induce, "pronounced histamine-releasing activity," from basophils (according to one study), there seems to be a possible link between ANA and C1 INH deficiency and/or autoantibodies. 3]/[micro]L Heterophils, % 71 [+ or -] 13 74 35-85 Lymphocytes, % 23 [+ or -] 12 21 6-55 Eosinophils, % 0 [+ or -] 0 1 0-1 Monocytes, % 0 [+ or -] 0 0 0-3 Basophils, % 0 [+ or -] 0 0 0-5 Heterophil: lymphocyte 3. Evaluation of blood parameters showed higher values of hemoglobin and hematocrit values and eosinophil and basophil counts in the Group I (Table-II). The positive basophil activation assay or basophil activation test (BAT), which was also associated with NCWS, has previously been demonstrated as a highly specific tool for food allergy including CM allergy. Mast cells, along with basophils and eosinophils, are classed as granulocytes because they all contain these packets of preformed mediators. 2010; 2011) reported QTL for TLR9, an immunity related element in gut, at 0 to 47 cM and for IFNG at 47 to 93 cM on SSC16 in a Duroc x Pietrain cross, where the QTL for basophil was also detected at 42 Mb in this study (Table 3). IgG is a sign of exposure in food allergies; however, only a few allergens have been evaluated and cut-off values determined (28) Cell activation test Basophil activation test (BAT) mimics in vitro contact of allergen and circulating basophils. Yogurt and garlic groups remained statistically insignificant in increasing Eosinophils, Basophil and Monocyte population both at treatment and levels which resemble with the study of Farinu et al. 05) differences in the basophil percentages amongst the chickens of groups A (0. We proposed to identify the meaning of elevated basophil counts with the XE-2100. What's the meaning of basophilia in Sysmex XE-2100?